There are a number of theoretical models of the human body that have been created for Happeh Theory, to assist in describing the construction and behavior of the human body. A few of these theoretical models are particularly useful to understanding why Tai Chi is performed the way that it is. 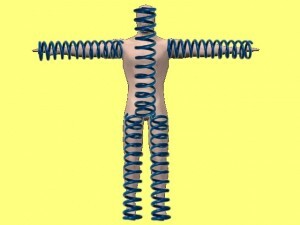 The Single Cylinder View of the Human Body – The Single Cylinder View of the Human Body can help explain perhaps….50% of the movements of Tai Chi. The Double Cylinder View of the Human Body – The Double Cylinder View of the Human Body can help explain the same movements that The Single Cylinder View of the Human Body explains, but with more detail. 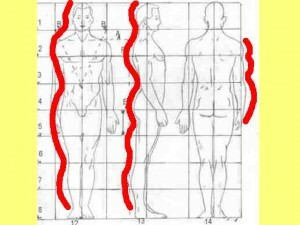 The Wave View of the Human Body – The Wave View of the Human Body can explain why Tai Chi practitioners develop the power they are known for. It can also provide insight into how the concept of wavelength can provide insight into the practice of Tai Chi. 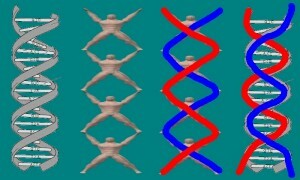 The DNA View of the Human Body / The Two Snakes View of the Human Body / The Spiral View of the Human Body. Each of the theoretical models above is based on a spiral. The Spiral View of the Human Body would be used for an exact scientific kind of theoretical model explanation. The DNA View of the Human Body was created to give a sense of familiarity to people. Most people have heard of DNA, so the thought was that they would be more receptive to a theoretical model named The DNA View of the Human Body. 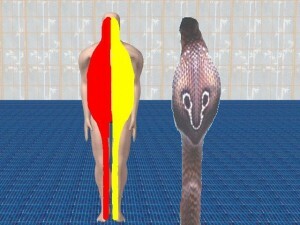 The Two Snakes View of the Human Body is a theoretical model that is based on or related to how ancient human beings conceived of the information presented by Happeh Theory. Ancient human beings didn’t know about DNA so they had to think of something else that was a spiral to describe how the human body works. They did not talk about spirals because the word or concept “spiral” is a scientific or educated kind of concept. A snake is a real life example of a spiral that most people are familiar with, so ancient human beings described the spiral nature of the human body as the snake nature of the human body. Regardless of the name of the theoretical model, The Spiral View of the Human Body, The DNA View of the Human Body, or The Two Snakes View of the Human Body can be used to completely describe the reason behind every movement of the Tai Chi form.